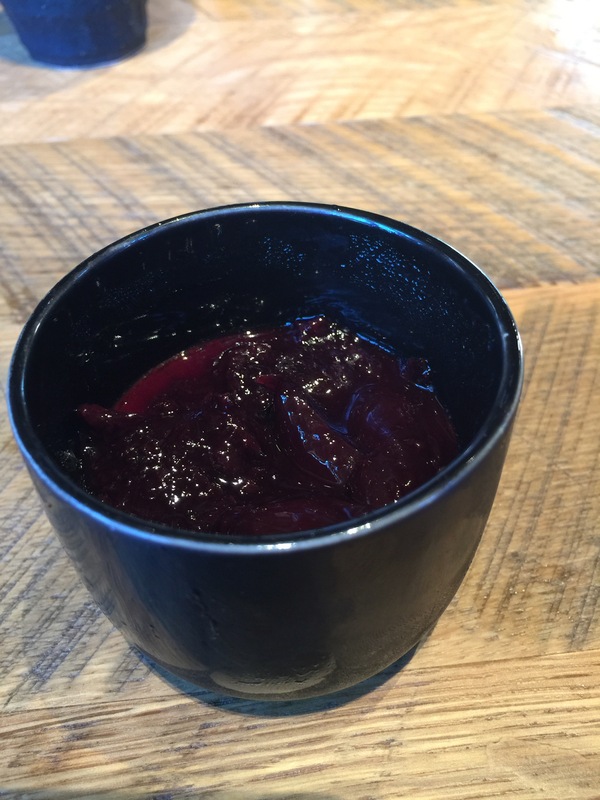 Today, I highlight the newest breakout in Napa’s wine country restaurant scene. 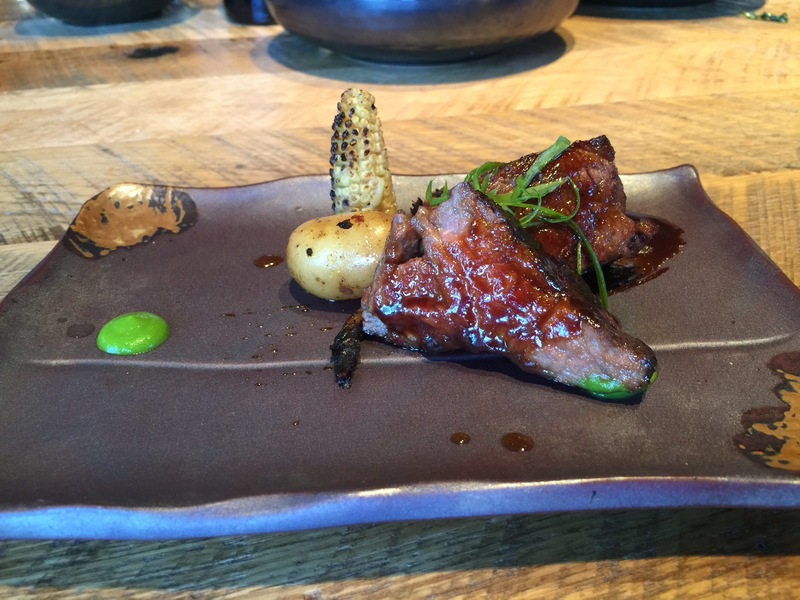 Two Birds/OneStone, located on the property of St. Helena’s Freemark Abbey winery, is Japanese-Californian yakitori fusion at its best. A few weeks ago, I was fortunate to experience the Grand Reopening celebration for Freemark Abbey’s renovated winery and new tasting room facilities. The gorgeous integration of old and new – the historic winery building was gutted down to its frame, and as rebuilt it features both old/reclaimed materials from the original building and new – adds new energy to my favorite winery. But just as exciting is the Freemark’s partnership with TwoBirds/OneStone. The result of a happy friendship between Master Top Chef TV show contestants Douglas Keane (Sonoma-based Michelin starred chef) and Sang Yoon (LA based Asian specialty chef), the restaurant has ambitious aims. 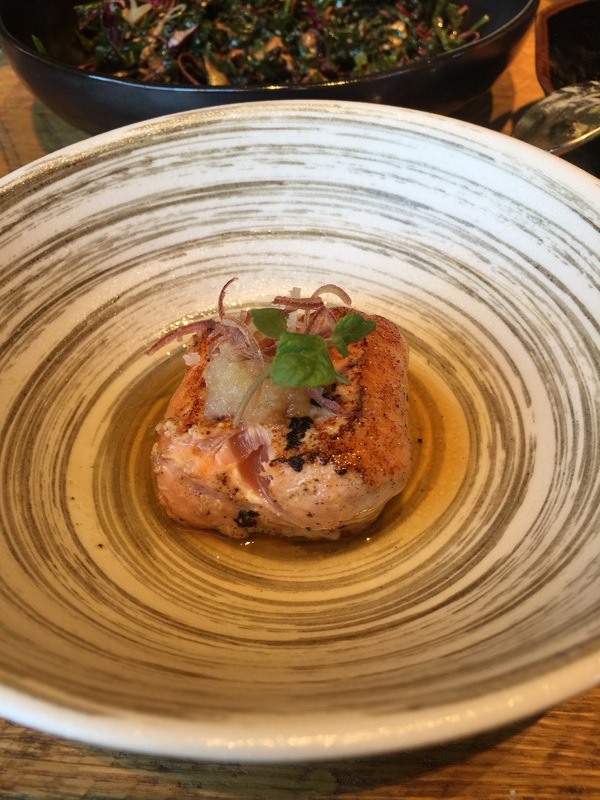 Upscale Asian restaurants, while plentiful in San Francisco, are few and far between in the Euro-centric Napa Valley – much less the casual small plate cuisine (such as yakitori, which traditionally are skewers of meat, primarily chicken) of Japanese Izakaya. At first glance, wine – particularly Freemark Abbey’s bold Cabernet Sauvignons – doesn’t seem the best match for Asian fusion. Yet my group of friends and I soon learned the genius in combining regional poultry and produce with perfect execution. The nuanced flavors somehow worked well with California wine. Surprisingly, the restaurant’s wine list featured no Napa or Sonoma Ames, instead highlighting select international wines. Baffled, we realized the restaurant’s goal was not to sell Freemark or Napa wines (why, when you can just walk next door!) but to offer patrons something unique for the area. If local wine is your fancy, however, you can take advantage of its FREE(!) corkage on any Napa or Sonoma county wine. For a restaurant of this caliber, this policy wins my support (especially after paying $65 corkage for one bottle recently in San Francisco). We took advantage of it on our visit, enjoying both a bottle of (unnamed) Sauvignon blanc made in a friend of a friend’s garage and Freemark Abbey’s Bootleg Blend – a powerful, yet smooth Bordeaux Blend concocted by Ted Williams, Freemark’s head winemaker. Ok, so let me get to the food. The food was simply outstanding. Our group of five each ordered two of the restaurant’s small plates, which included a smattering of both cold and hot, both meat and vegetable based dishes. Dishes arrive as they’re completed, which was like a parade of culinary gifts for the palate. Each bite was a new surprise. 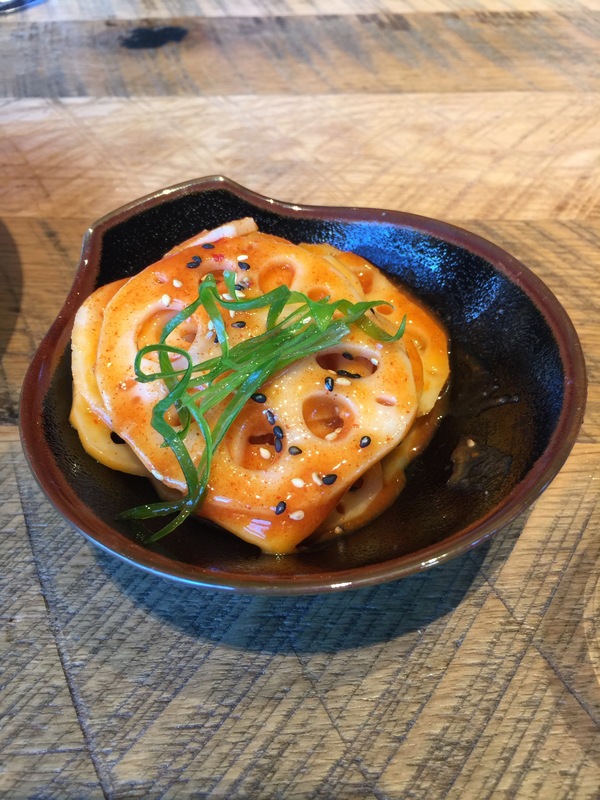 The lotus root kimchi was a great palate cleanser, its marinade lighter and less salty than traditional varieties. the black kale salad – so good, we ordered two! The black kale salad married interesting textures and delicate Asian flavor. I couldn’t stop eating it. The spinach with sesame-rice dressing also was a nice departure from the often overbearing, standard sautéed spinach that graces many a restaurant menu. As for the meat dishes, poultry, seafood, and beef each were outstanding. 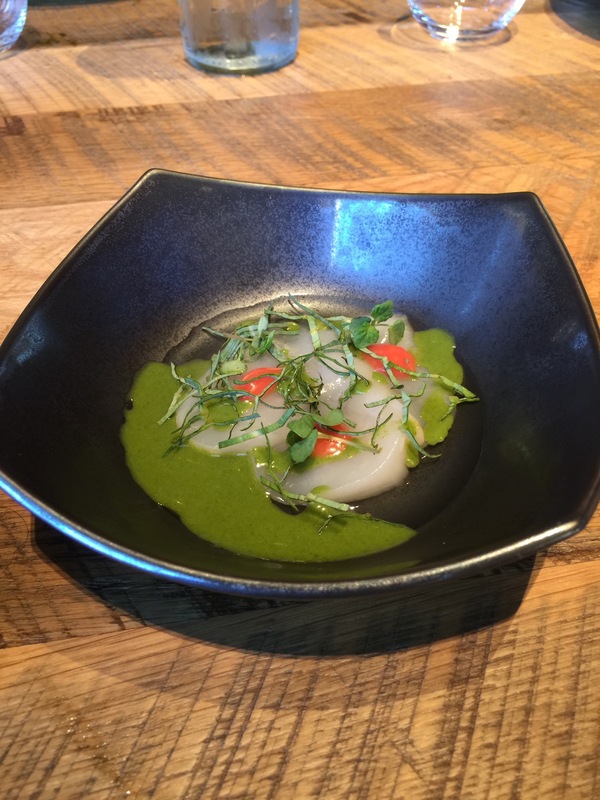 We sampled the night’s special – a raw scallop and radish concoction. Its subtle flavors and freshness were ideal for an appetizer, yet something about it (floral note?) reminded me of my grandmother’s house somehow. The rare salmon met my picky standards with zero fishiness that I usually pick up upon instantly. While these dishes were amazing, I much preferred the duck and chicken meatballs. I cannot do either dish justice in words. 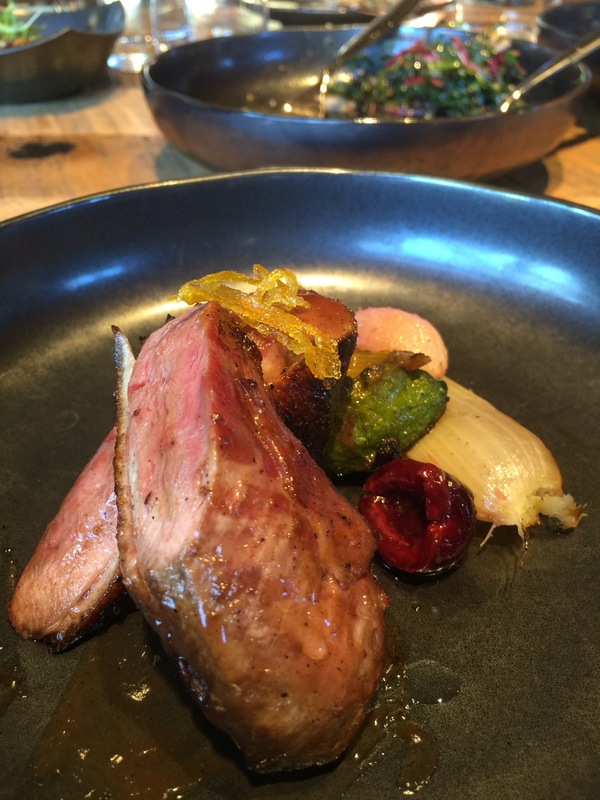 The duck was tender, its tamarind and cherry-based glaze the perfect, intensely sweet match for the meat. 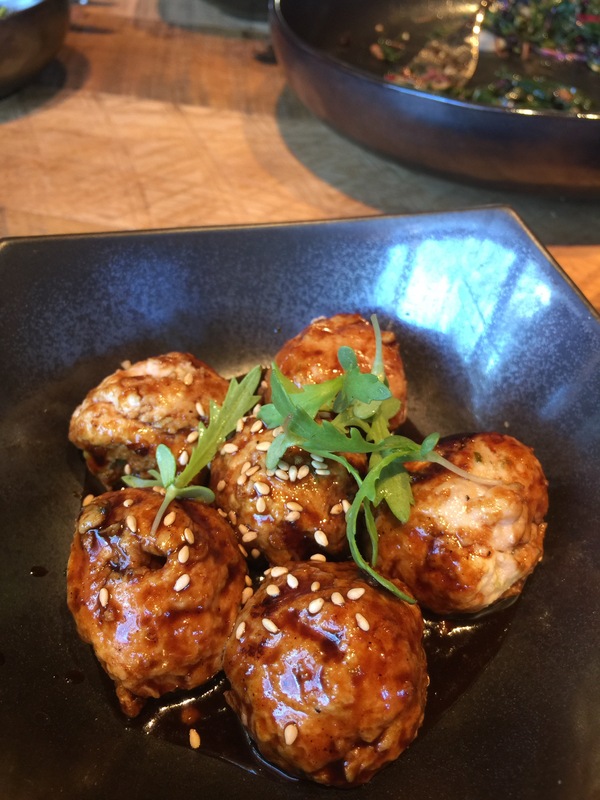 The chicken meatballs were light, almost weightlessly melting in one’s mouth amidst a base of hoisin sauce. In fact, the chicken meatballs, deceptively humble, were the most memorable dish of the night. Lest I neglect it, the crispy-on-the-outside, softly marbled inside Waygu beef short ribs also were about as good as wagyu gets. 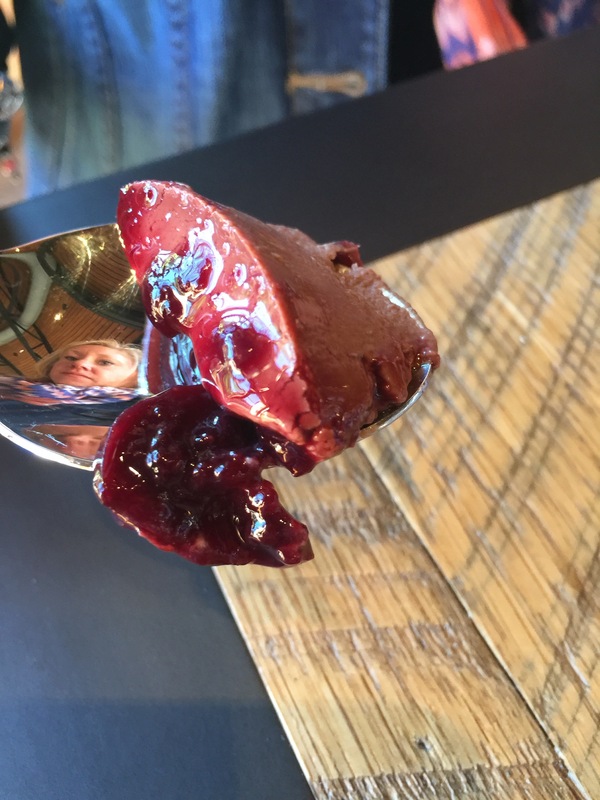 kikori whiskey and chocolate custard, topped wirh cherry compote. We couldn’t skip dessert after such a great meal. We all shared the matcha (green tea) soft serve, as well as the kikori whisky and chocolate custard. The latter earned high praise from me. I could have eaten three orders of it single-handed. Like our savory dishes, it managed to be satisfyingly intense yet light. 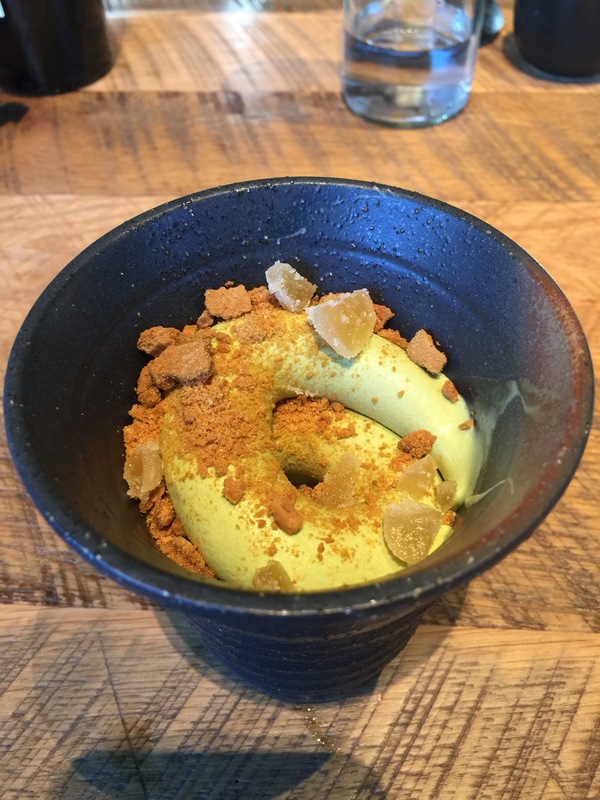 The matcha soft serve fit well with the restaurant’s theme, and the flavors were interesting, but it felt a little too much like eating sushi for dessert. Unanimously, our group felt our dinner was a complete success. 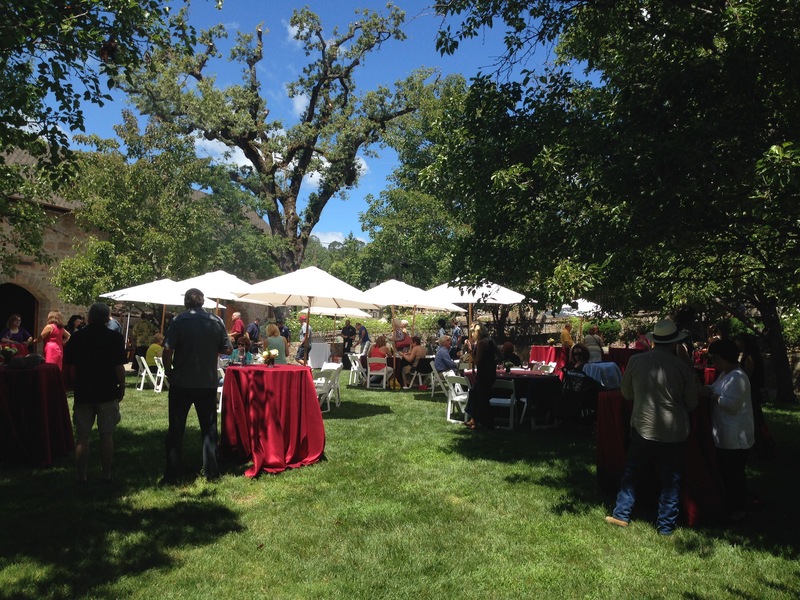 We managed to enjoy every bite and sip, along with great company, in a lovely, spacious winery setting. We also were happy that a meal at this level did not break our wallets – less than the equivalent of a bottle of Napa wine per person. I can’t wait to return. Another great article! Glad I found this blog. I have not made it to Two Birds yet but we have a reservation there for two Saturday’s from now – right after our inaugural trip to Freemark Abbey. The restaurant is managed by the father of one of my co-workers so I’m excited to give feedback (her father was also one of the founders of Cyrus in Healdsburg). Great article! I recently posted about our first experience there (see link below) but really enjoyed your write-up as well. You ate some dishes that we did not get to. Love the writing and the pictures. I keep making the mistake of eating the dish and then forgetting to take a photo first. So all my pictures are the “last bite.” Have enjoyed your older posts as well, including the write up on Willamette, where I’m going in a couple of weeks.